in the plaza outside the church! 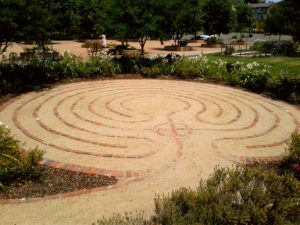 A labyrinth walk can represent a life journey, a pilgrimage to a sacred place, or a prayer bringing us to God. reflectively facing a problem or issue. Sometimes you may walk the labyrinth looking for an answer. You may walk simply to be open to what comes. A labyrinth walk is a spiritual and personal journey, and therefore it is a sacred path.